Fall protection is an essential part of any workplace- particularly those workplaces that involve working from heights such as on scaffolding or aerial lifts. 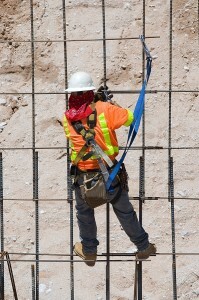 Many employers enact a fall protection or rescue plan for dealing with emergencies in such a situation. The Occupational Safety & Health Administration (OSHA) launched a dedicated fall prevention campaign in April of last year, dedicated towards providing the education and equipment necessary to ensure worker safety on-the-job. Falls are the leading cause of worker fatalities in the US, with more than 200 killed and 10,000 wounded annually. OSHA feels that, even with the risk of working in high places, these numbers are avoidable. While many employers have fall prevention procedures in place- whether these be harnesses, guardrails, or safety nets- many companies fail to take into account the need for a rescue plan as well. Even if not falling, a worker’s life can be endangered by the lack of a rescue plan. Injuries while on a scaffold or aerial lift, anaphylactic shock from a bee sting, or even sudden vertigo or dizziness can put lives at risk when workers are dozens or even hundreds of feet off the ground. Even in the event of a “prevented fall” wherein a worker is wearing a safety harness…he’s still dangling in the air with no way to be recovered safely without the intervention of emergency crews. While a rescue plan is easy to implement on paper, OSHA has adopted the newest ANSI/ASSE Z359.2 and ANSI/ASSE Z359.4 standards to address proper implementation and define such terms as “prompt rescue” and outline OSHA’s General Duty Clause in greater detail. In light of the recent fall prevention campaign, these two standards are an essential basis for any employer’s fall prevention and rescue plan. As an employer, it is your responsibility to ensure the safety and security of your workforce. Make sure all of your employees are properly trained with the OSHA 10 Hour Construction course online via www.osha10hourtraining.com and up to date on the latest training standards. If you don’t have one already, improve your safety profile with a dedicated fall prevention and rescue plan today!